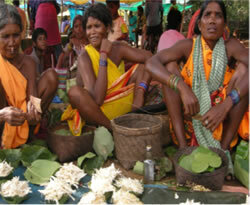 Bhotra synonymous with Bhottada are predominantly found in all blocks of Nabarangpur district except Raigarh and Chandahandi. Out of 4.51 lakh population in the state 3.25 Bhatra population live in Nabarangpur district as per 2011 census. Mr. Tylor has identified them with the Murias of Bastar and it is told that they are immigrants from Bastar. “It seems that both Murias and Bhottodas are the sub-divisions of the great Gond Tribe”. (Gopinath Satapathy, 1964). Mr. Bell has expressed his doubt about the origin of Bhatra. Bhotras are very rich in culture. They are naturally talented in the skill of their traditional folk dance, folk music and folk song. They perform Cherechera dance during observance of Pus Parab and Daunidarnat dance during their weedings. Indigenous musical instruments made by Dom musicians like Dhol, Ghumura, Tamak, Tudubudi, Baisi (Flute), Mairi (Mohuri), Dhapa (Circular Drum) and Gini.